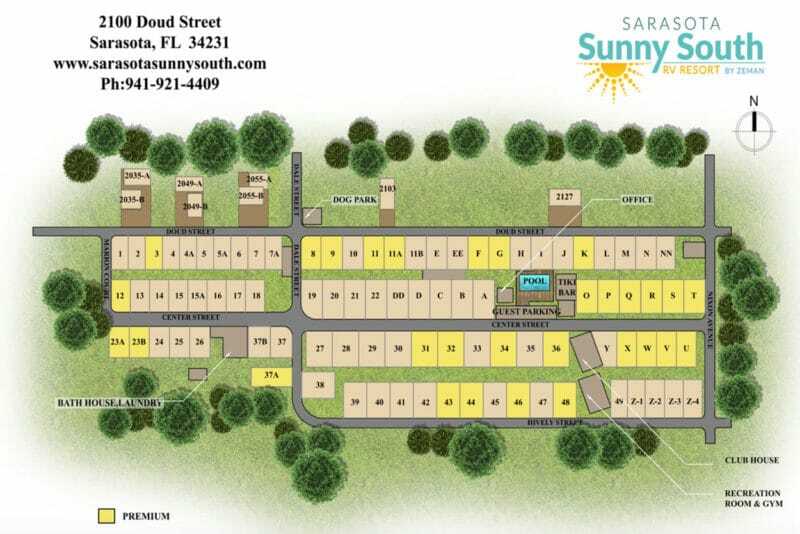 We would love to welcome you to Sarasota Sunny South RV Resort! 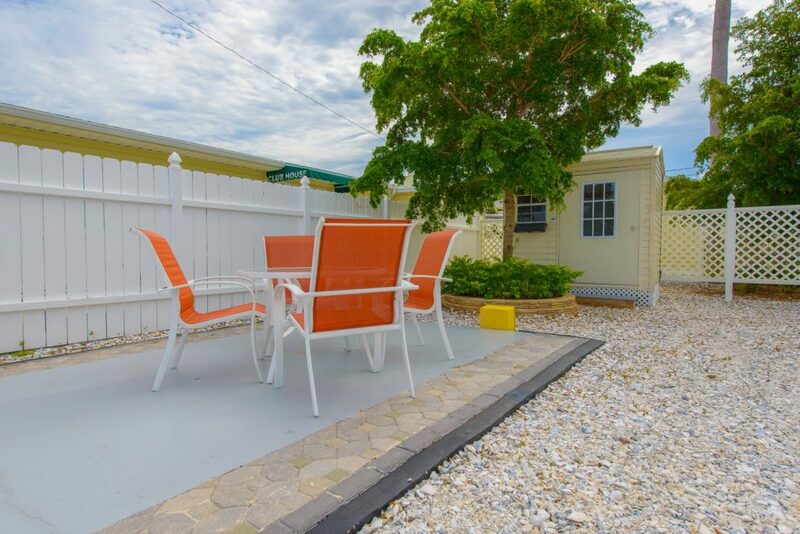 Located near the Gulf of Mexico along the beautiful West Coast of Florida, our RV Resort offers great on-site conveniences and easy access to the most beautiful beaches in the world. Pack your bags, park your RV, and prepare to have some fun in the sun! Call us to reserve your space at 941-217-7699 or fill out the form below and we will contact you within 24 hours to finalize your reservation! Off-Season monthly rentals and annual sites – electric is not included. Rates include water, sewer, electric (30/50 amp), cable TV, Wi-Fi. RV’s 10 years or newer are welcome in the park (or must be pre-approved and in pristine condition). Specific sites are not guaranteed. We will do our best to assign the site of your choice, however that may not be possible. Sites may be changed to accommodate larger rigs or longer stays. $200 Deposit on stays less than one month. $500 Deposit on stays of one month or longer. $100 Cancellation fee when cancelled 60 days or more prior to reservation date. No refund when cancelled less than 60 days prior to reservation date. Full payment (less deposit) due on arrival. Payment may be made by check, debit card, credit card or cash. $10.00 Cash Refundable Key Deposit for Bathhouse, Laundry & Gym. 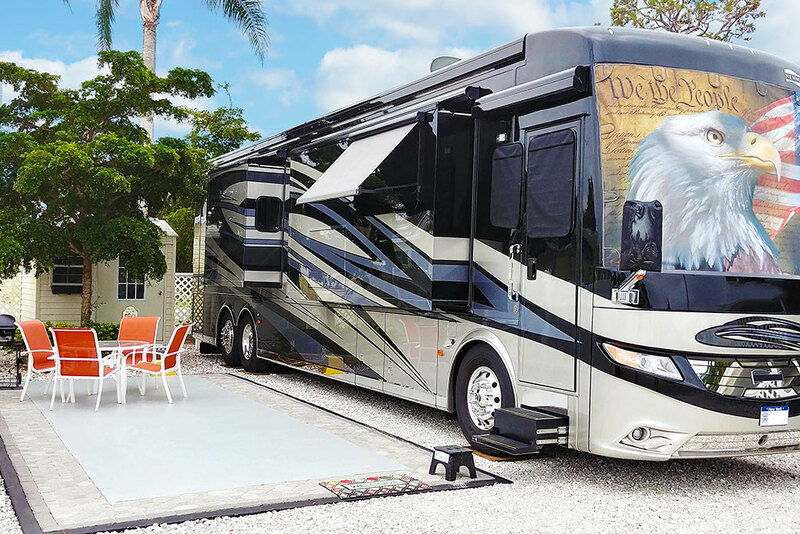 It is our goal at Sarasota Sunny South RV Resort to provide services and products which enable guests to enjoy a safe, secure and pleasant environment. Management reserves the right to address any issues that are not included below. Quiet time is 10:00pm to 8:00am (this includes generator and engine noise). Excessive noise or inconsiderate behavior may result in expulsion from the park. Please DO NOT drive or park on cement slabs or brick pavers. Guests may park a maximum of 2 vehicles at their site, lot size permitting. Day visitors to your site can park in designated visitor parking (by pool). All RV reservations are for 2 adults. Additional overnight visitors must be at least 25 years old and must register at the office upon arrival. A fee of $20 per night per guest must be paid in advance. RV sites are limited to 2 additional guests per RV. All registered overnight visitors may use the park amenities and attend park functions. Non-registered (day only) visitors may not use the park amenities (pool, clubhouse, laundry, or gym) and cannot attend park functions. Guest is responsible for the actions of visitors and occupants of the RV site. Visitors must be accompanied by guest when in the club house or pool area. Open from 9:00am till dusk (Florida state law). Please observe the posted pool rules. Alcohol is prohibited in the pool area. No glass containers in pool area. The gym is for use by guests and registered visitors. Recreation room restrooms are for use while working out only. Please be respectful of our facility. The laundry facility is for use by guests and registered visitors only. A key is available at the office. Please be respectful of our facility. Laundry left unattended is subject to removal. Open to guests and registered visitors. Feel free to exchange or contribute books, magazines, games, puzzles, or DVDs (located on clubhouse bookshelves). Clubhouse restrooms are for use only while at pool or during clubhouse events. Contact the office for permission to use the clubhouse for non-Resort sponsored use. Intended as an outdoor gathering place for guests. Remember to respect others by being mindful of an appropriate outside noise level. Lights automatically shut off at 10pm. Cooking and plugging in of devices that heat up are prohibited. No smoking. Garbage is picked up on Wednesday. Trash must be bagged and placed at the roadside in cans provided, with lids secured. Recycle bins are provided for mandatory recycling. Refer to park handout for recycling information. Cans and bins must be removed on the same day and kept at the rear of your site. Allowed at individual sites only. Butts must be disposed of properly. Cigar smoking is only allowed inside guests’ RVs. Permitted at your site for a $25.00 fee, payable at the office. Other vehicles (cars, trucks, golf carts) must be taken to a car wash. Cleaning of windshields upon arrival is permitted. No appliances, clothes lines, indoor furniture or other unsightly items are permitted outdoors. No tents or free-standing structures. Towels and swimwear may only be hung at the rear of your RV. Do not place grills or hot plates on picnic tables. No mechanical work is allowed, except for emergencies. Only one RV is permitted on a site. Awning stakes, flags, lights, etc. may only be placed in the ground close to the concrete pad; otherwise consult with the park manager before you dig or drive stakes. Utilities are buried just below the surface in some areas. Respect others’ RV/mobile home sites by refraining from walking through their “home” area. ABSOLUTELY NO WOOD FIRES. All RVs are to be kept in good condition and maintained to the high standards of the Resort. Guests are responsible for the general upkeep and the tidiness around their site. 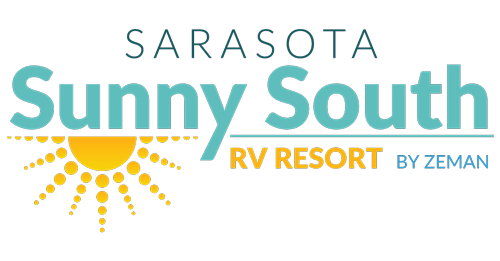 If the RV and site do not meet the standards of the Resort in terms of condition Management reserves the right to terminate the agreement at Sarasota Sunny South RV Resort. RVs 10 years old or newer are welcome in the Resort. Towables (e.g., boats, cargo trailers) are prohibited. Towbars and car dollies must be stored behind your RV. All planters must be removed upon departure. All official regulations apply as per Florida Statute #513 and the Florida Administrative Code 64E-16 Guest(s) hereby indemnifies, releases and holds Resort, it officers, owners, employees, and agents (the Resort parties) harmless from any property damage, personal injury, claims, cases of action. and/or liabilities arising out of or related to the use of the RV site, the Resort and/or conditions thereon, regardless of whether such loss was caused by negligence of any of the Resort parties or guest(s). Amendments to these rules are at the sole discretion of the owner and can be changed by Management without notice. When walking your furry friend, please be mindful of the common areas and safely walk them in the street. All pet droppings must be picked up and placed in a plastic bag before depositing in the garbage. Pets must be attended to when outside. Although we enjoy pets, they’re prohibited from being inside our buildings, tiki hut or pool area. Vaccinations and proof of rabies shot is required at check-in. Aggressive breeds will not be accepted and management reserves the right to refuse any pet. Please stop by the office for information about our dog park and dog run.